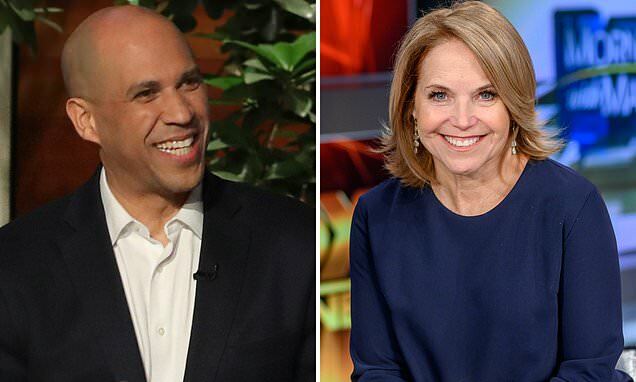 Katie Couric has revealed she once went on a blind date to a Giants football game with Cory Booker - but admits the pair didn't kiss. Presidential candidate Cory, 49, is now dating Rosario Dawson. But 62-year-old news anchor told The Wendy Williams Show she went out with the Democrat 'a long time ago'. She said: 'I had a blind date with Cory Booker once. We went to a Giants football game. Did we kiss? No, we did not. In 2012, Booker appeared on Couric’s talk show, Katie, as a guest. Cory gushed over girlfriend Rosario during an appearance on Ellen on Wednesday and even teased the idea that the pair may have a White House wedding if he wins the 2020 presidential election. And it seems Katie is also a fan. She added: 'I really like Cory and I really like Rosario Dawson, so I'm happy for them, how beautiful she is.